There has been some interest in the wedding photo which has been used to head the genealogy pages on this web site. So far we have been unable to identify the family or the place where the photo was taken, although it is known to be in the Grewelthorpe, Kirkby Malzeard area. If you can help with any information, names, dates, places etc please do so. The following letter has been sent by Ann King. This website is such a useful resource for family historians with an interest in the local area. 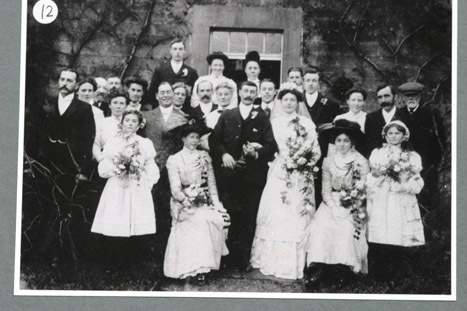 I return to it again and again, but when I first saw the lovely photograph of the wedding on the genealogy pages I was immediately struck by how like my grandmother was the bridesmaid/maid of honour seated second from the right in the front row. Although my grandmother, Elizabeth (Lizzie) Hill moved with her parents to London when she was about 2 years old, she returned regularly to Kirkby Malzeard to visit her relatives. 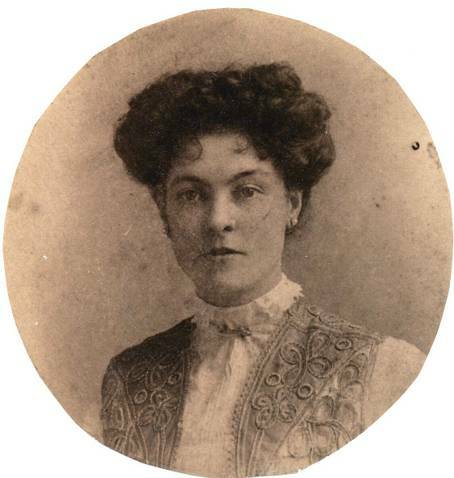 She was the granddaughter of John Beck, the miller and innkeeper, by his daughter Mary Beck (born 1841 at Kirkby Malzeard Mill). I think the likeness is so strong that it might even be Lizzie, or possibly a Beck relative, in the photograph. It would be very helpful if someone knew which building the wedding group is arranged in front of. Is it one of the local pubs where they might have held the reception? The clothes suggest that the wedding probably took place in the early 1900s. It would be really good to hear if anyone can identify any of the people in the photo from their own family pictures? If it were not my grandmother in the picture, I think it might be the person who my mother called ‘Auntie Maggie’ ‘ she kept the public house in Kirkby Malzeard with her husband Nehemiah Rowley. They were married in 1902, and it could even be their wedding in the photograph. My Lizzie Hill was a first cousin of Maggie Rowley. Lizzie had been born in 1878, and, within 2 or 3 years, her parents had moved with her to London. Maggie had been born in 1871, and had inherited the licence of the Henry Jenkins Inn from her father and mother, William and Ellen Moore. Before the Moores, the licencee had been Ellen’s father, John Beck (the miller/innkeeper). Censuses show that Maggie worked as a barmaid with her parents in the pub before becoming the licensee herself after they had died. It would be good to hear from anyone who has any information ‘ even to prove me wrong!